For the duration of our stay in the Golan Heights we stayed in the lovely cabins at Kibbutz Afik, situated in the southern Golan. 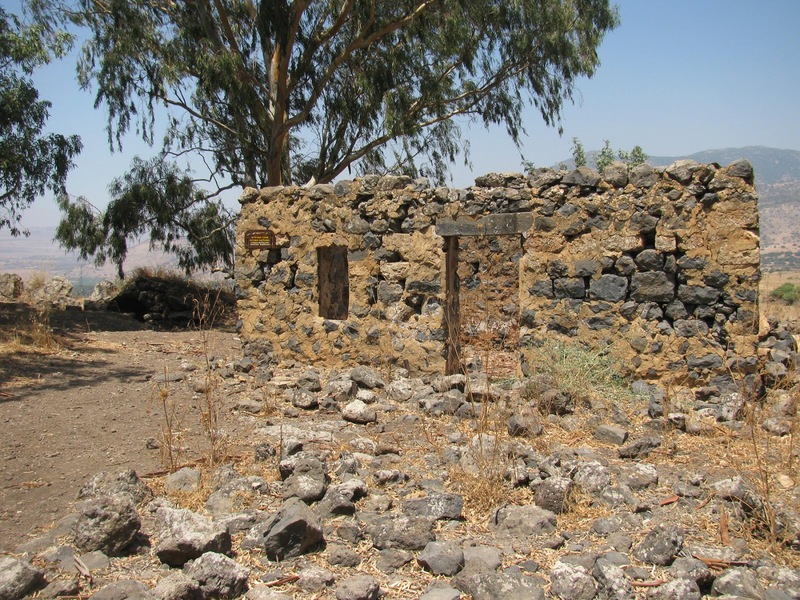 Kibbutz Afik is located near the site of Fiq, which originated in Roman times as a Jewish village and later became a Syrian army base and village until the Six Day War. 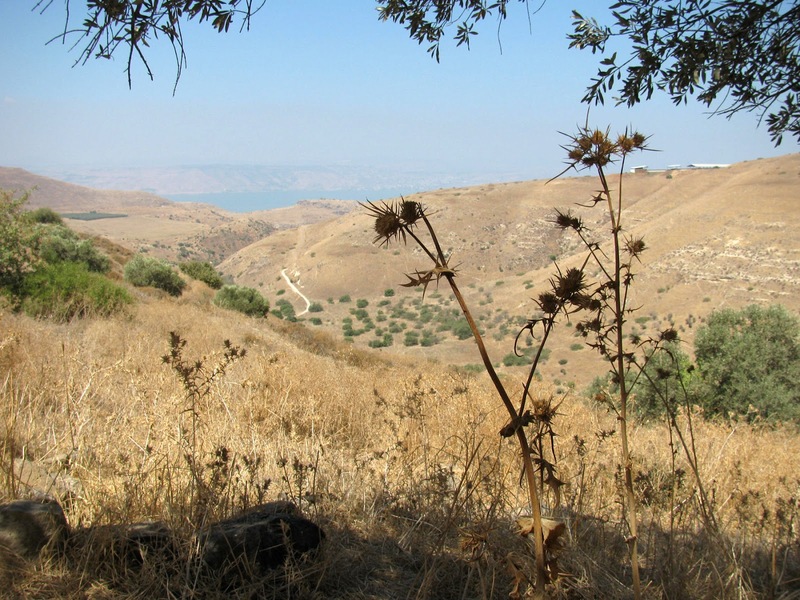 Fiq (Pik) is mentioned a number of times in the Bible, in the Book of Kings, and this biblical city is thought to be located close to modern-day Afik. We soon learned that there is a circular trail, starting from the Kibbutz viewpoint, which leads to the abandoned village and, though it was hot, we decided to check it out. Ein Pik is a family-friendly, two-kilometre route that passes fig tree thicket on either side of a stream, wild blackberry bushes, olive trees, prickly pears, pomegranate trees and more. There were a number of gorgeous viewpoints throughout the trail and we enjoyed beautiful views of the south-eastern end of the Kinneret (Sea of Galilee) and the settlements of the Southern Golan Heights. After a short climb we found the Ein Pik Spring, which emanates from within a small cave in the basalt crag. A group of young kids and their parents were already picnicking in the area, so we decided to simply keep walking. The trail finished at the ruins of Kfar Pik, below. 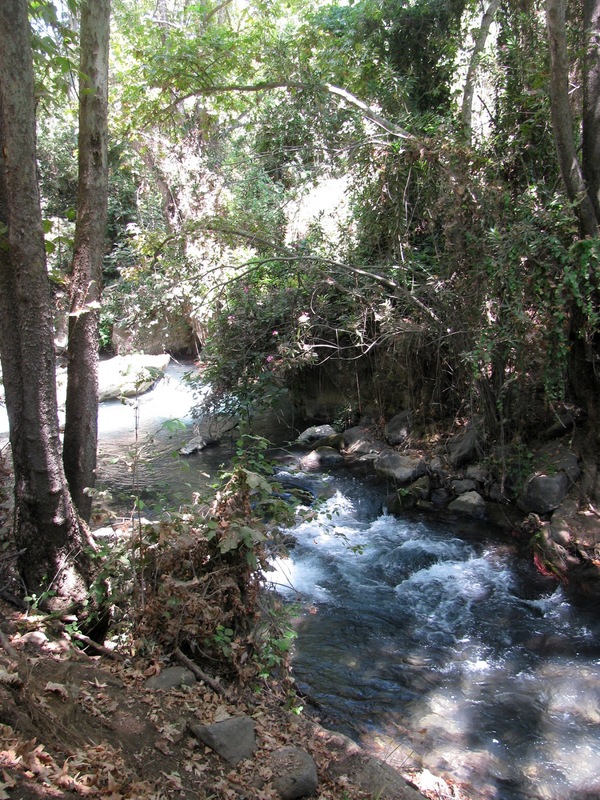 The Hermon Stream Nature Reserve, more commonly known by its Arabic name the Banias, is one of the most beautiful spots in Israel with its waterfalls, springs and streams. There are two entrances to the reserve, one to reach the hanging trail and the Banias waterfall, and another to the Banias Springs. 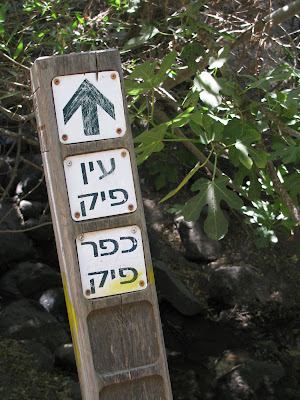 This summer we visited the 33-foot high waterfall, the tallest waterfall in Israel. 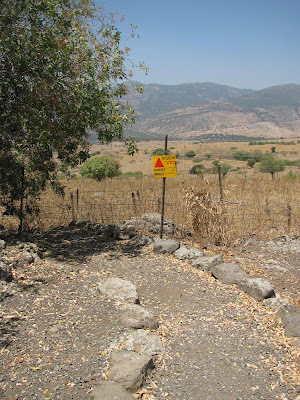 You need a second car to do the hike across to the other part of the park, Banias Springs, which we didn't have. 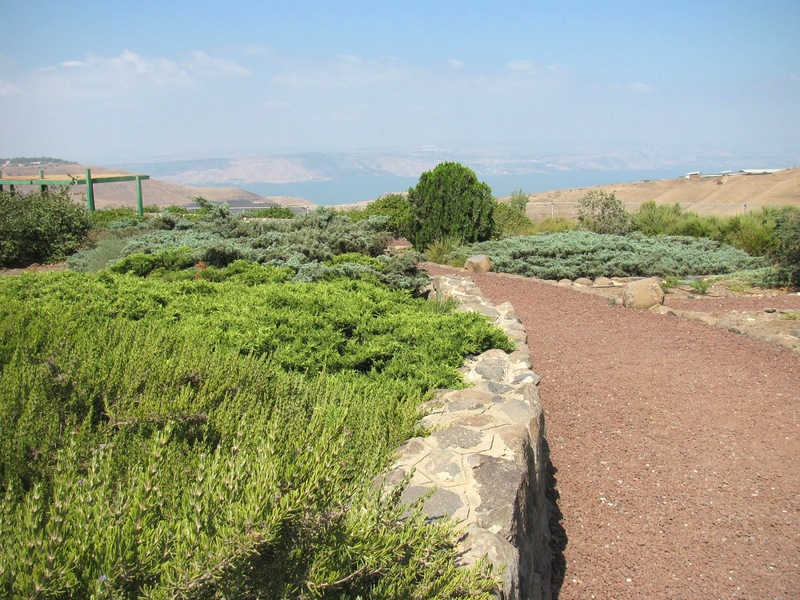 Just another reason to go back to the Golan Heights for another holiday! 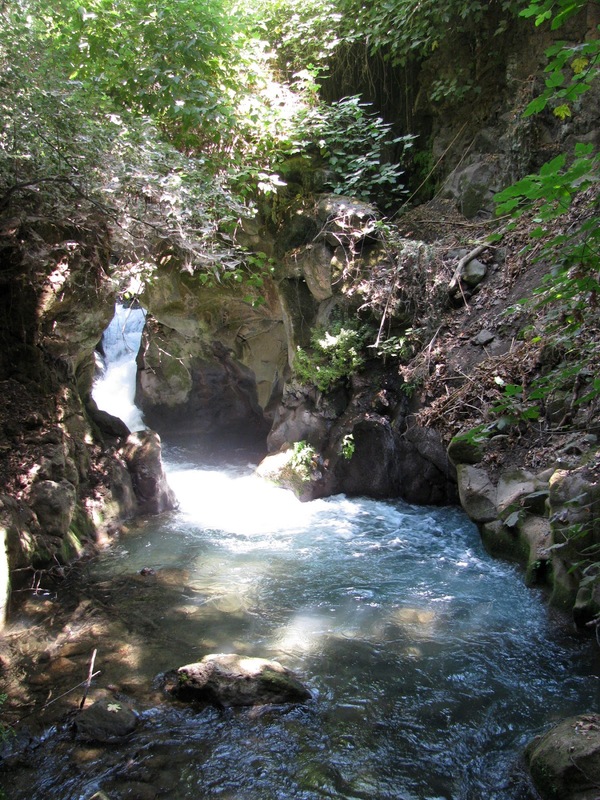 Banias was originally named "Paneas" after the Greek god Pan. 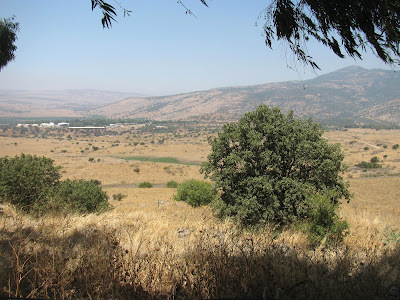 Since there is no "p" sound in Arabic, and the region was long under Syrian rule, the village that grew up around the spring came to be called Banias, and Dan to the ancient Jews. The first park encompasses the Banias Spring and ruins from the Roman period, when the village was called Caesarea-Philippi after King Herod’s son Philip, who inherited the area and made it his capital. The palace of Agrippa the Second, grandson of Herod, is among the relics. 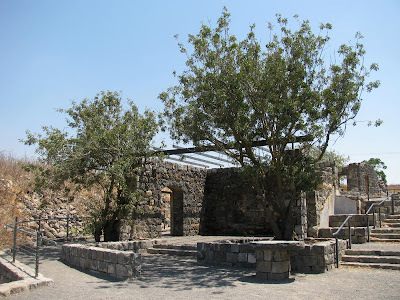 The Cave of Pan, courtyards, and niches for rituals dedicated to the worship of Pan, dating to the beginning of the Common Era, can also be found there. 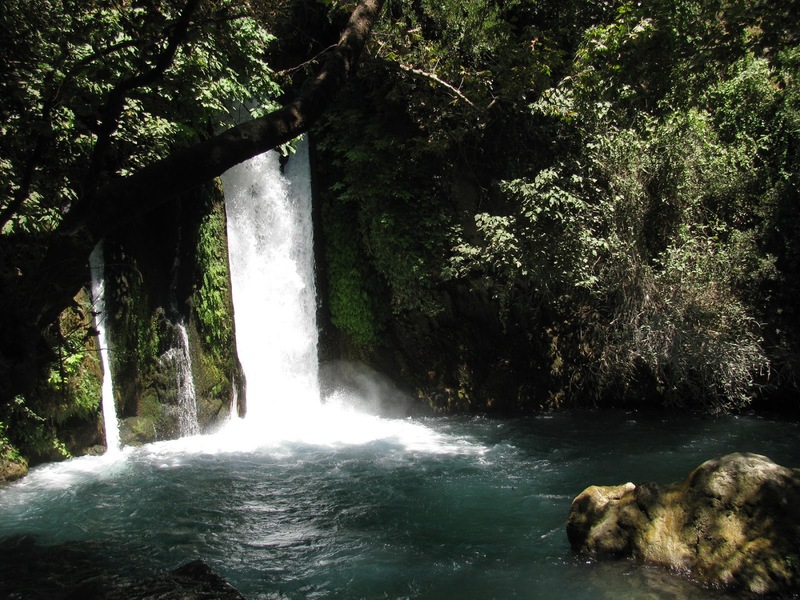 The Banias Spring, which emerges from the base of Mount Hermon, Israel’s tallest peak, leads to the 33-foot high waterfall, the most impressive cascade in Israel. Nine kilometres from its source, the Hermon Stream meets the Dan River and together they feed the Jordan River. We decided to hike the hanging trail, a bridge spanning 260 feet, built to give the appearance of being suspended in mid-air above the Hermon Stream rushing 7-10 feet below. We followed the trail upstream, against the flow, which took us to the Banias waterfall. At times we were tempted to stick our feet into the cool waters. However, access to the Hermon Stream has been strictly forbidden since the early 1990's, in order to preserve the delicate ecology. The trail was beautiful. The dense foliage along the riverbanks includes plane trees, poplars and willows, and almost gives the impression of a rainforest environment. 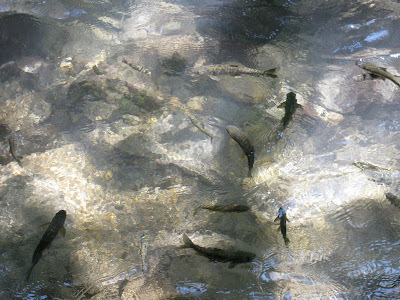 In the waters of the stream one can see varieties of fish including barbel, hillstream loach, and tilapia. There are also snails: freshwater gastropod and crescent shaped mollusks. The loud crashing waterfall at the end is stunning, although not really that big by international standards. The nicest feature was that it sprayed cool mist into the air, making the area around the waterfall seem cooler than the rest of the area. It was a very hot day when we visited, so the cool, misty air was a welcome change. 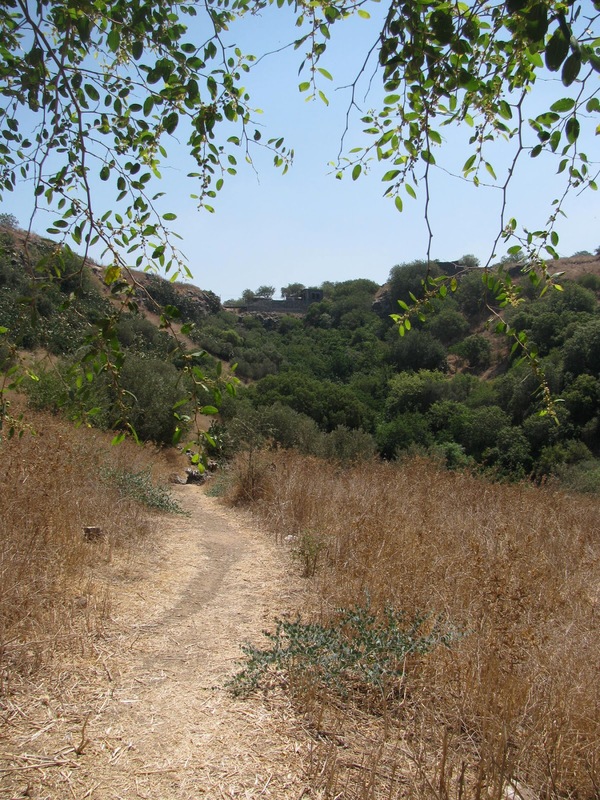 At Mitspe Golani, also known Tel Facher, below, we learnt about one of the fiercest battles of Israel's history. 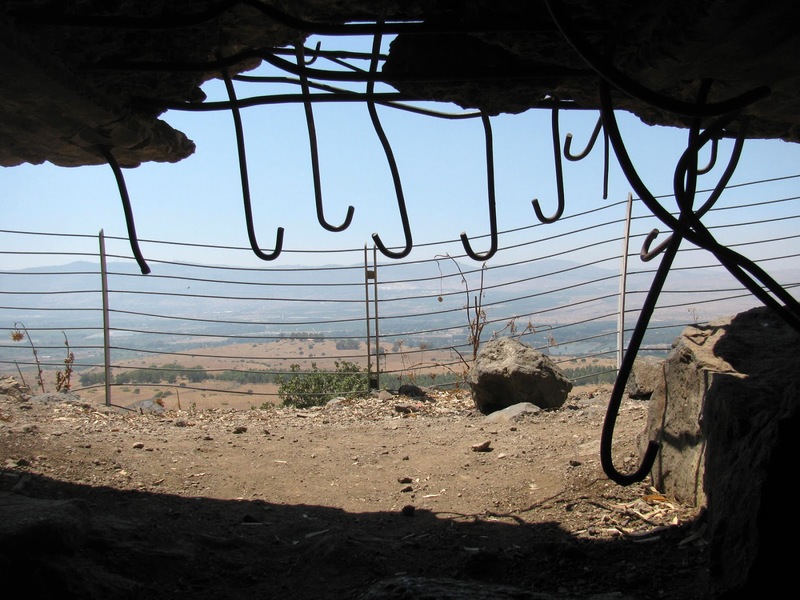 For almost 20 years, Syrian guns on Tel Facher dominated and terrorized the entire region. Upon the outbreak of the Six Day War in 1967, Israel jumped at the chance to seize this important fortification and end the Syrian stranglehold over Israeli citizens. Over the course of a five hour battle, every single Israeli soldier but one was either killed or wounded, but by the end of the day, the base was in Israeli hands. 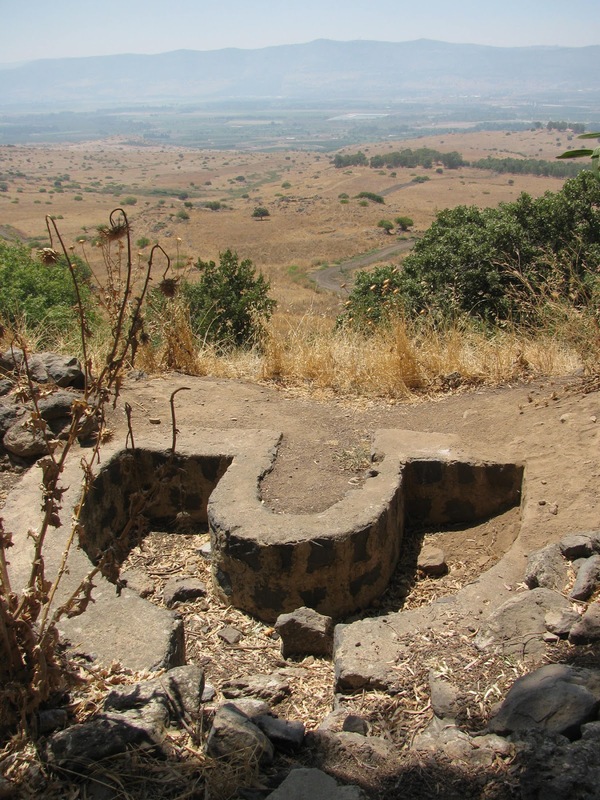 Today, the site is known as Mitspe Golani or Golani Lookout, renamed for the Israeli Defence Force’s infantry brigade whose soldiers fought and died for this base. An impressive memorial has been built to honour the memories of the Golani soldiers who fell here. A low memorial wall lists the names of the fallen soldiers. We were able to wander around the well-marked Syrian trench system and walk through the narrow, well-fortified bunkers. With the exception of adding the memorial, the military features of the site have not been reconstructed since the moment of capture in 1967. 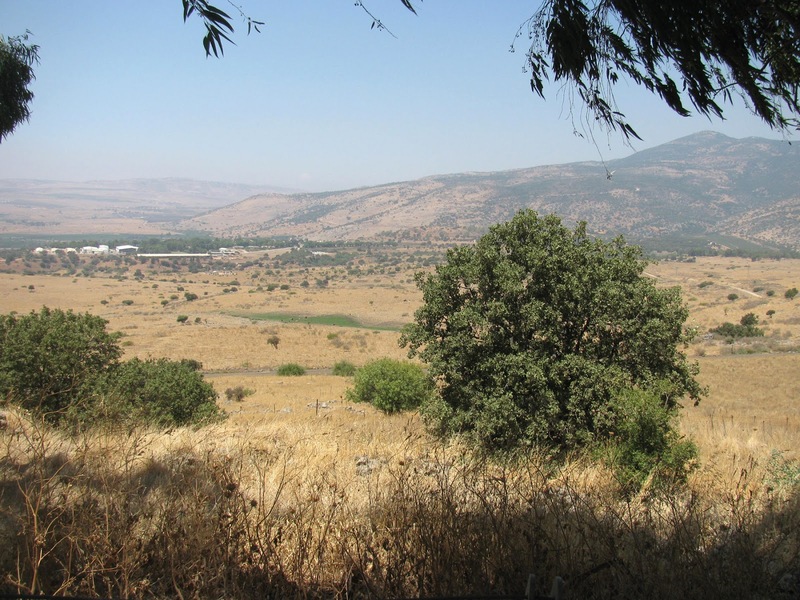 Since the base is located so high in the Golan, we also once again enjoyed magnificent views of the region and of the Hula Valley below. But the most memorable part of our visit? 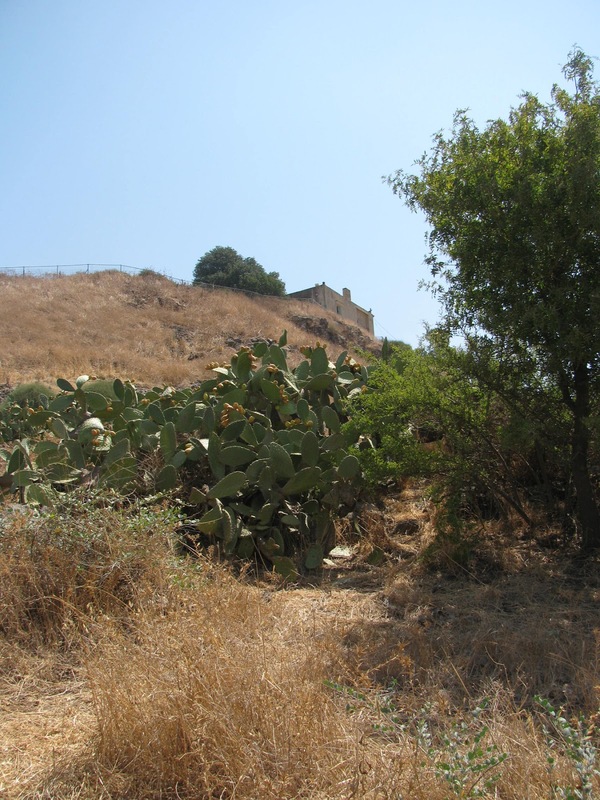 Upon arrival we met a gentleman who told us that he had been a soldier in the battle at Tel Facher. He told us of his experiences in the battle, and in Israel's resulting wars. He told us about his children and the wars that they have experienced. He was proud, sad, and obviously emotionally attached to Mitspe Golani, which he has visited five times this year alone. It was an honour to meet him. it does look dry and hot, but then there's a respite in the falls! 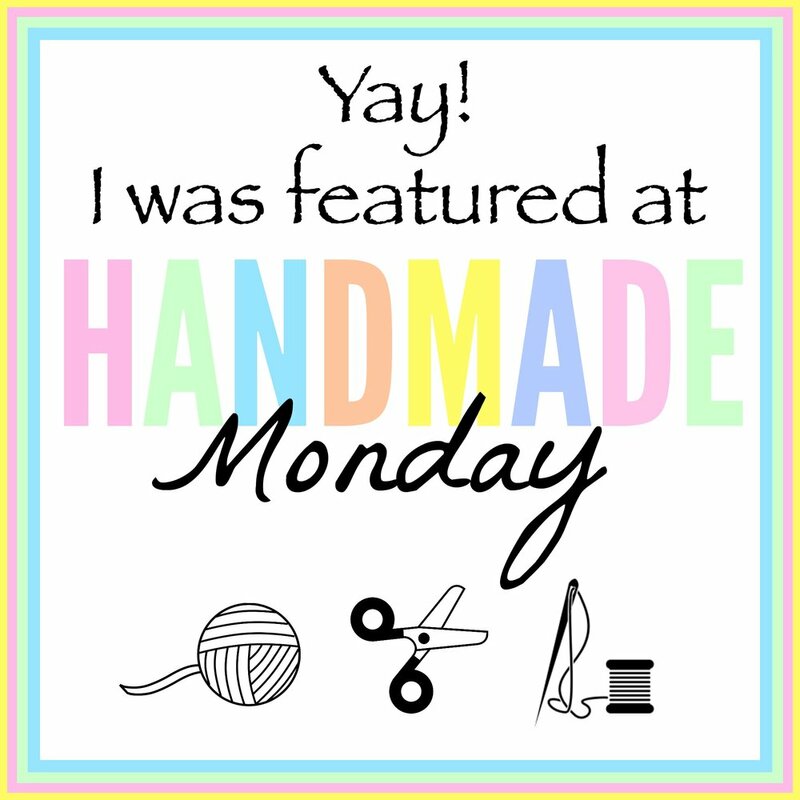 Such great history! The waterfall and stream looks a lot like the environment 2 hours north of me in the mountains. So beautiful! I love the sound of waterfalls and streams. 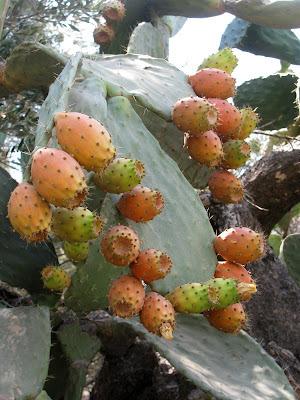 The cactus plant is gorgeous with the peachy color.